Parkeologists have discovered something truly incredible in a nearly deserted corridor of Innoventions West. Yes, low-traffic restrooms. But also something even more amazing: evidence of an alternate dimension in the Epcot Timeline mural. Sharp-eyed visitors can find this evidence near one of the lesser ruins of Walt Disney World. Note the nondescript blue doors in the picture below. Back when this pavilion was known as Communicore, these nondescript blue doors led to a room containing a remarkable Robot Show. When Innoventions came along, this theater held the Imagineering Labs, providing a preview of the Aladdin virtual reality technology that later came to DisneyQuest as an attraction. For many years the room sat vacant, used only for staging Segway Tours and wine seminars for the Food & Wine Festival. Until only a few years ago, it was transformed into a small but nicely executed Epcot museum in honor of the park’s 25th birthday. The museum is no longer open, but an Epcot timeline remains posted to the wall outside. It’s an informative read for budding parkeologists. 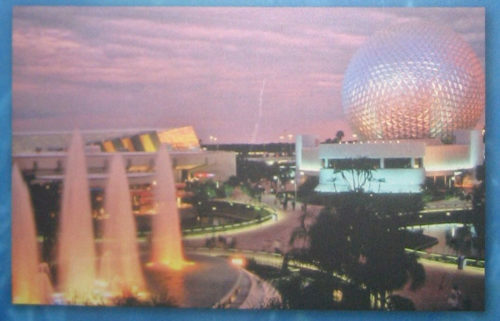 But the strangest part of this timeline is a photograph of EPCOT Center as it never was — as it never possibly could be. Take a look at one of the images for 1982. It’s clearly a picture of the back side of Spaceship Earth, as evidenced by the corporate lounge protruding from the sphere. But something is not quite right here. No, I’m not referring to the reflecting pools that once graced the central Communicore plaza (where that awful Pin Trading Station is now). I’m talking about some other strange energy at work that makes this shot impossible. The picture shows a flipped version of reality, with Universe of Energy appearing on the east side of Future World, instead of the west side. This entry was posted in Disney Theme Park Hidden Secrets and tagged Communicore, Epcot, Innoventions, Universe of Energy. Bookmark the permalink. I SEE!! It’s the Universe of Energy standing where the Living Seas should be! Yep! The picture is flipped! There is a flash of lighting in the background of that picture! Im almost positive. Its right in the middle. At first glance, it does look that way! I think it’s actually just a smudge on the glossy finish though. The lightning appears to extend over the treeline. Then again, maybe it’s evidence of the magic portal into Bizarro Epcot? The earlier comment had it right. The picture is flipped. there’s no way Universe of Energy should be on that side of Spaceship Earth. please tell, i’m dying to know! The picture was taken and the negative was flipped?